How often do you open the buy menu, buy AWP, then go back, then buy Kevlar + Helmet and the go back to buy pistol again. This might get annoying sometimes. To get rid of this annoyance, I use “key binds” which helps me buy weapons quickly within a single tap of a key! Whether you follow this tutorial or not, enabling of the developer console is highly recommended. By enabling it, you can type most of the commands in console itself instead of going to options every time. You go enable console by going in options > game settings. To create your own buyscript simply write bind “ANY KEY YOU WANT” “buy ANY WEAPON” in your console. If you want to buy many weapons by pressing one button, list them in the “buy” part. You have to write “buy” before each weapon and separate them with “;“. NOTE: It looks like Valve didn’t add some guns’ names in the list. That’s why you can’t buy p2000, CZ75, Sawed off by typing their names. And that’s why YOU CAN’T CREATE A BUYSCRIPT FOR TASER! Buyscript purchases weapons in the order that you listed e.g. 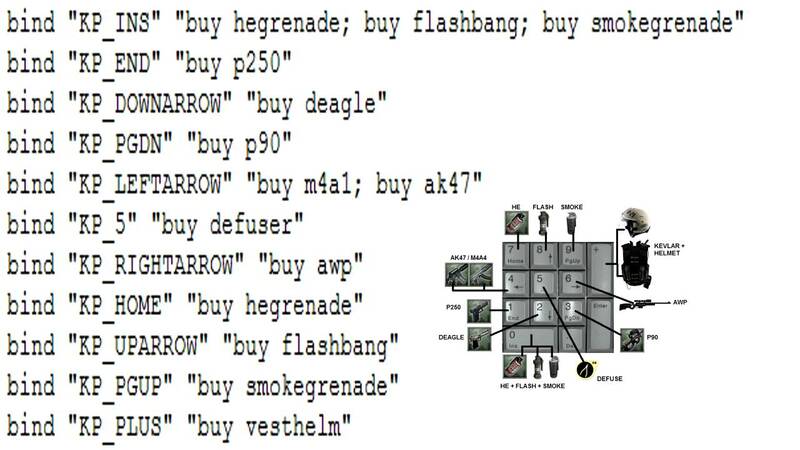 if you write “buy ak47; buy deagle”, the buyscript ‘ll buy AK first, then it’ll buy deagle. If you don’t have enough money for ak, then it’ll buy only deagle. So it’s better to write the the more needed weapon first and the less needed weapon last in the “buy” list. ← How to Download and Install Custom Fonts in CS:GO? CSGOBET.CLICK » New sites » How to buy weapons faster in CS:GO using key binds?